PRICE RANGE HK$ 400 to 3000. Installation may be extra (we paid HK$ 400 to have ours installed). PRODUCT RATING Cooool. Fans cool you gently without making you vulnerable to colds. According to a study conducted by Cardiff University, “Air conditioning itself may contribute to infection with common cold viruses. The lining of the nose is covered with a thin layer of mucus which protects against infection. Since air conditioners extract moisture from the air they may cause some drying of the protective mucous blanket in the nose and predispose to infection. The cold air may also help viruses to establish a hold in the nose as they reproduce better in a cold nose”. Not to mention the havoc that is caused to your body when you walk into a freezing cold room after having been outside in the blazing heat. GREEN RATING Quite Green. Fans consume only one-tenth the electricity compared to an air conditioner. However, due to the inconceivably poor design of Hong Kong apartments – with large, protruding bay windows that trap heat, windows that don’t open to allow ventilation, etc – fans can only be used primarily as a complement rather than a substitute for air conditioners. Fans are simple, durable devices. In comparison, air conditioners are complex to manufacture and dispose of safely. New air conditioners contain refrigerants (flourocarbons) that do not deplete the ozone layer, but still contribute to global warming because they are potent greenhouse gases. Modern humans are comfortable within a fairly narrow temperature range – according to the EPD, over 90% of building occupants feel comfortable with temperature between 22.5C and 25.5C. In Hong Kong, where summer temperatures can easily rise above 30C, we face a conundrum – do we use an air conditioner to make ourselves cooler today, while pumping more greenhouse gases into the atmosphere that will guarantee a hotter climate for ourselves in the future? One way we can try to maintain a cooler living environment while lessening our impact on the planet is to use fans. By installing a ceiling fan in our bedroom, we have been able to reduce the number of nights we turn on the air conditioner by about 30% (the two weeks at the beginning and end of summer). Even when we do use the air conditioner, we are able to able to set it at 26C. For every 1C increase in your thermostat setting – you reduce your electricity consumption by 3%. The ceiling fan can be installed anywhere that you have a lighting fixture. 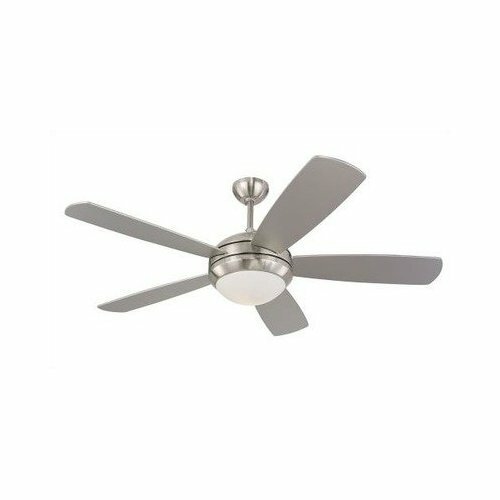 Low powered fans can be installed in the hole for a light fixture without drilling. They combine the fan with lighting fixtures in one unit that is easier to install (but you probably still shouldn’t attempt to DIY). A high powered fan is cooler but requires drilling into the ceiling. High powered fans are also cheaper to buy because they are not ornamental. For apartments with low ceilings, fans with stems as short as 7 inches are available. There are also a wide assortment of styles – from classic to contemporary – to suit your home decor. Installing and uninstalling the fan can be pain though if you move often. If you go to your local electrical shop, they may be able to recommend an installer. Ceiling fans are a great solution to helping us stay cool today while minimizing the greenhouse gases that will make us all hotter in the very near future. Previous Previous post: Where to buy a cast iron pan?